Open Evening – Standing Room Only! It was standing room only at our Open Event last night. The school was clearly the place to be on a lovely, warm, late summer evening. The high level of interest in the school and all its achievements is a testament to the hard work and dedication of staff and governors. Our students are very proud of their school. We work very closely with the local Primary schools to provide excellent transition, and induction, for Year 6 students. A key highlight of yesterday’s event had to be the enthusiastic speeches delivered by three new Year 7 students. No one could argue that Ysgol Rhiwabon is the place to be after listening to them. Staff in the school were delighted by the support shown on the evening from members of the community, and ex-students. Member of Parliament, Susan Elan Jones, herself a former Ysgol Rhiwabon student, welcomed local families to the school. Students were excited to see Naim Arsan who took time to attend the event to share his football success and Welsh caps. The Headteacher, Mrs Ferron-Evans gave a presentation at the start of the evening. As a former student of the school herself, Mrs Ferron-Evans was keen to emphasise both the values of tradition, hard work and community links, and also the need to ensure every young person achieves the very best they can. She discussed all the exciting initiatives in the school which have contributed to the school’s success. “I am really pleased with how our Open Evening went. The level of interest shown in our school has been fantastic and I now look forward to meeting our new intake again. The school website reflects the historic links we have to the area and I’ve used this to show our strong community focus and how successful our students have been over time. 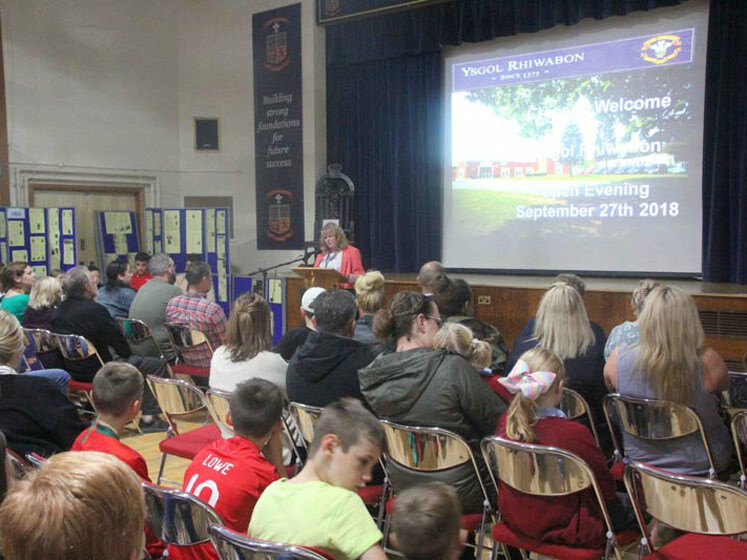 I was delighted to be able to speak to so many parents, grandparents and friends of the school, face to face during the evening; it was a pleasure and I would like to thank everyone for their extremely positive comments about the school’’. The Open Evening was extremely well attended by prospective parents, and reflected the increasing interest in our historic school which serves the South Wrexham county area. See more pictures of the evening in our gallery, here.